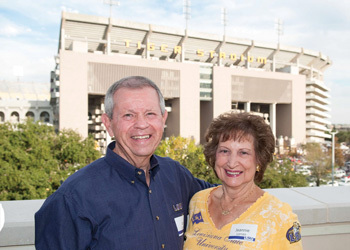 More than six decades after meeting on campus, Loy R. "Pug" (Business, '63) and Jeannie Lorren have established a sizable endowment through their estate to recruit in-state students to the LSU E. J. Ourso College of Business. The Lorrens were inspired to give by a display at their "honorary" grandchild's high school. Around graduation time, a small flag represented each university that gave scholarships to seniors; Pug and Jeannie were disappointed to see only one for LSU. Their gift will allow the Ourso College to award merit-based scholarships to full-time undergraduate and graduate students from Louisiana high schools. "We worked our way through college and graduate school. There were no scholarships or TOPS program back then," Pug shared. "We know what it is to be short of money when you're going to school. That's really what prompted us to start thinking about making a meaningful gift: What could we do to make it easier for students to get through today?" Both Pug and Jeannie enrolled at LSU in 1956. They married in 1958 because, as Pug puts it, "The love bug bit us, and we couldn't wait!" The couple moved upstate for Pug to complete his undergraduate degree at the University of Monroe, then returned to LSU so he could earn his MBA. Pug spent the entirety of his career with what is now known as AT&T, encompassing operations, personnel, and marketing roles until he became director of BellSouth's fleet of more than 31,000 vehicles. "The motor vehicle shop worked at night. When an installer arrived in the morning, not only was the vehicle repaired, but the oil was changed and the tank was full of gas. The ice bucket was filled with ice water, and all of the supplies had been replenished," Pug said. Following his retirement, the couple settled down in Mandeville, La., closer to their daughter, Shelley. They hope the scholarship opportunity will keep Louisiana's next leaders in state for college and beyond. "LSU really brought us together. It's very important to us to give back to the university that we love so much," Jeannie added. Like the Lorrens, you can make a difference for the next generation of students at LSU. To learn more, contact Julie Bolton Falgout, PhD, at 225-578-5846 or jfalgout@lsufoundation.org.